Dr. Adia Winfrey running for Congress in Alabama. Photo courtesy of Winfrey's campaign. From Alabama to Pennsylvania, black women are running for office at every level, but their experiences highlight some of the unique challenges they face as candidates. Why it matters: It's difficult to build a diverse bench of candidates — something the national party campaign arm says is "crucial to winning back the House" — when black female candidates feel slighted by the Democratic Party because they want more help in running a campaign for the first time. By the numbers: There are at least 43 black women running as challengers for the U.S. House of Representatives, but only one has the DCCC's backing. There are no women of color in 33 states' congressional delegations, per the Center for American Women and Politics (CAWP,) and 30 states have never elected a woman of color to Congress. Winfrey said that she was never around politicians or in political circles growing up. “As African Americans we are not taught or groomed or raised in that political mindset to understand this is what you do," she said. Often, black women find unique ways of fundraising, like hosting a hip-hop concert to raise money for her campaign. Black women have unique experiences. Many of the women Axios interviewed highlighted the life perspective black women can bring to the political table. 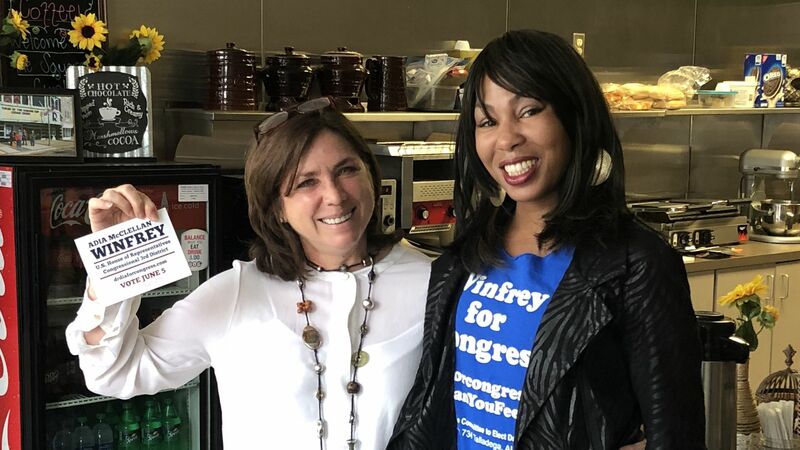 Michigan congressional candidate Kimberley Hill Knott said they better understand the issues facing women and people of color — things like "poverty, homelessness, the environment, health care, and small business support." Kerri Harris, running for U.S. Senate in Delaware, told Axios: "There aren't enough voices in congress that truly understand the plight of the average person." She worked at a Delaware chain gas station frying chicken before she decided to run. "It doesn't matter if you’re pushing a broom today — tomorrow you could be making the rules." There's an implicit bias against black women, some of these candidates say. Knott said she's had constituents ask: "We already have one woman of color in office representing Detroit, why do we need another?" Harris, in Delaware, added: "As a POC it's knowing that every single thing is scrutinized." She's biracial and identifies as black, but said that she struggles recognizing how "racially charged" things have become. "You go in front of groups who are just as much you because you’re biracial. But a predominately white room doesn’t see themselves in you." The Trump factor: Winfrey in Alabama said President Trump "is going to help my campaign more than anybody could’ve ever known" because he "opened up the door for people running for office to do things that they were previously told they couldn’t do." Go deeper: Black women candidates feel slighted by the Democratic Party.